Today, I am sharing the process I used to create my first successful product. Now, this process is far from perfect. In fact, I would refer to it as “Beta” version of what I hope my team’s product creation process will be someday. But I can definitively say that this process worked for me! It’s the process I’ve used to take Jeffalytics from $1,000 in product revenue during 2014… to over 100K worth of products sold in 2016… to $100K in sales during one week during 2017. 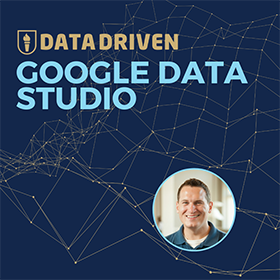 In this edition of Behind the Scenes, I’ll share how we select the products we create at Jeffalytics. I’ll show you how we figure out which products our customers want. And I’ll discuss how we were able to get traction with the core products we continue to sell. I’ve been a full-time digital marketer since 2005. And even before that, I was an online creator. But the majority of my career I’ve been consultant and marketing agency owner. I have had very a nice career in the agency business. But something was always missing. I didn’t have my own product to promote in the marketplace. So in 2013, I set out to create my own products. My dream of being a product creator didn’t start out quite as smoothly as I would have hoped. I didn’t make $1,000 in revenue from my products until 2015. It took me over a year of work just to generate $1K worth of sales. Oops! Some lessons are learned the hard way. But I persisted… And in 2016 I made over 6-figures in revenue from online products sales. And then in 2017, I launched a new product that resulted in $100K worth of revenue in one week! These results allowed me to transition Jeffalytics from a consulting company to a product-focused company. How did we get traction? 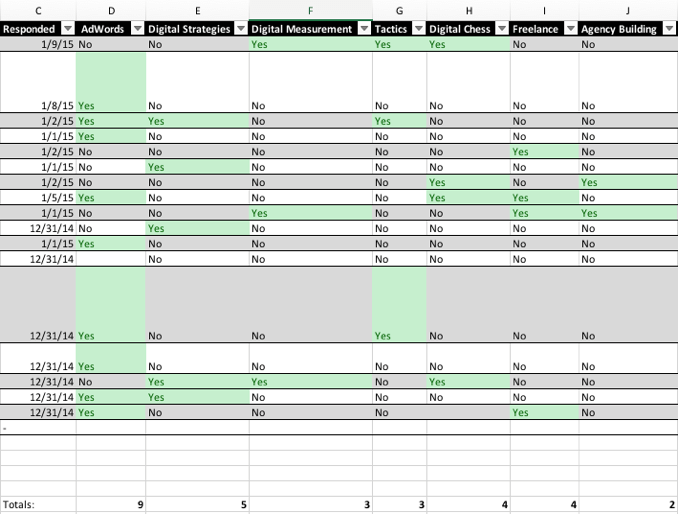 The first significant change in my product selection process happened at the end of 2014. As 2014 came to close, 12 months of experiments with new product ideas had resulted in just $1,000 worth of sales. In order to keep going, things needed to change in a hurry. I was starting to get desperate. But, my desperation led to a new idea. A lightbulb moment so to speak. So, I took all of my product ideas and wrote them down in an email. Then I sent out a survey to my list of about 1000 email subscribers. In the email, I set up a link to a survey in a Gravity form. 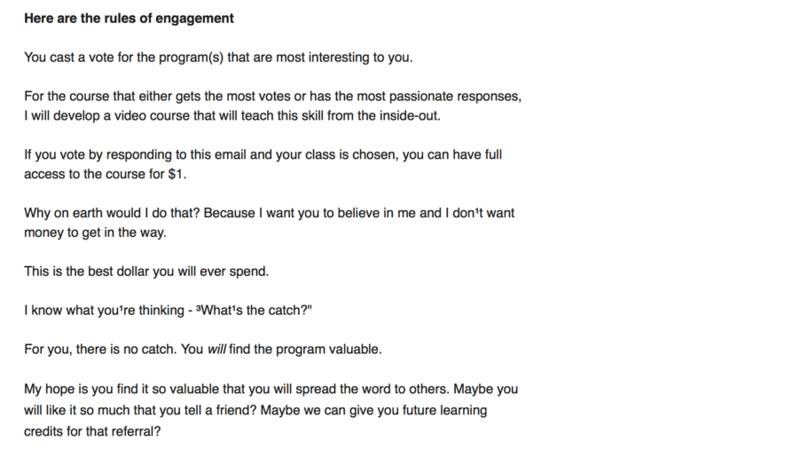 And I asked my subscribers to vote for the course they had the most interest in. 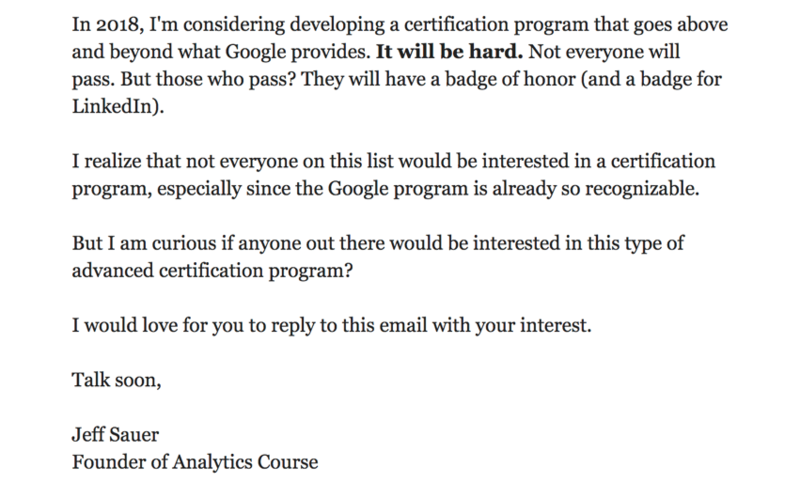 At that time, most of the people on my email list had participated in one of my in-person trainings. So, I had a personal relationship with many of these subscribers. First, they could buy the winning product for $1. After credit card processing fees, I wasn’t even going to make any money on this offer. But, the feedback and motivation of paying customers was super valuable to me. 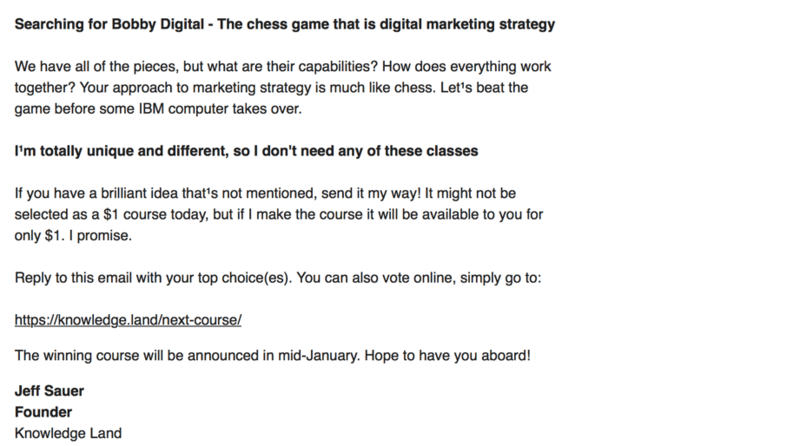 Second, I committed to building the most popular course by February 1st, 2015. 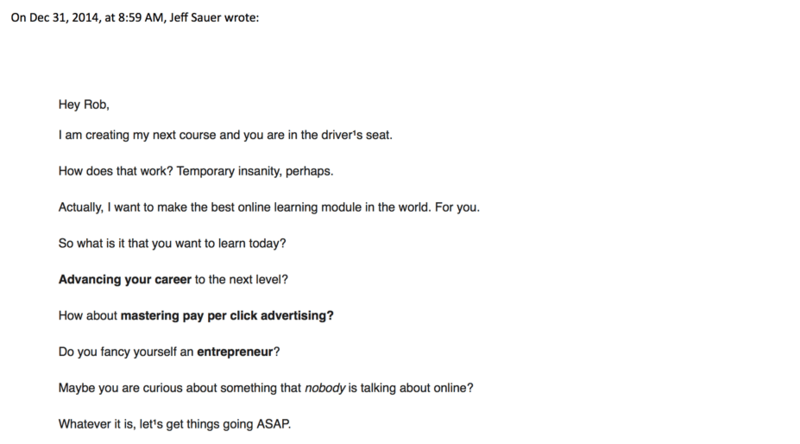 That gave me under 30 days to create a complete online course around the winning product idea. Thankfully, the responses to my email started rolling in. I got all sorts of feedback. Some subscribers even ignored my survey altogether and wrote me full replies about what they wanted to learn. 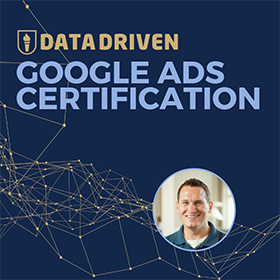 And, after tabulating the votes from all the responses, the winner was… Google AdWords. My subscribers were most interested in learning about Google Adwords. So, I created my PPC Mastery Course. Fast forward to today, almost two years later, and over 4,705 students have purchased PPC Mastery Course. This past November I presented at a workshop in Bali called Startup Grind. During the workshop, I shared this story, in more detail, with a group of entrepreneurs. So if you want to hear more background about my start-up experience, you can check out the video below. This product selection process worked so well to help me get into action, and create valuable products that we still use it today. Just this past summer we sent a detailed survey out to the Jeffalytics email list. And once again our subscribers responded. 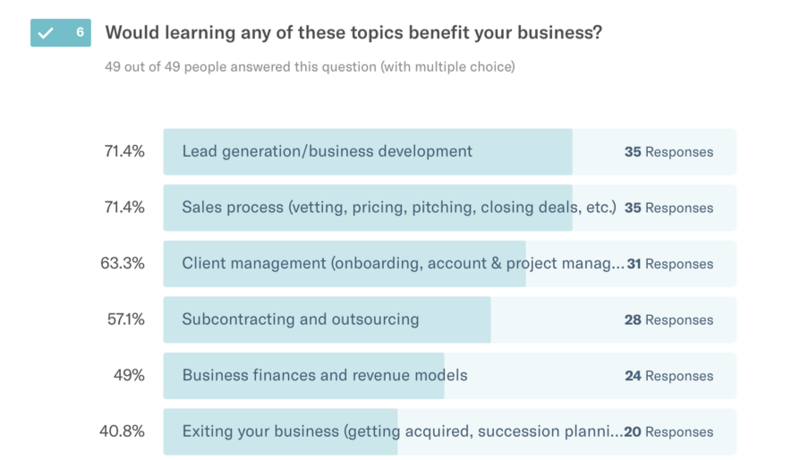 We discovered that our subscribers wanted to learn about lead generation. They were also really interested sales processes and client management. 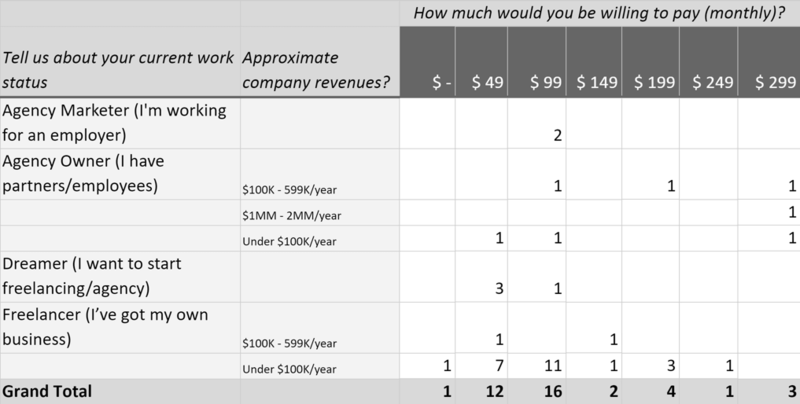 In our survey, we also asked our subscribers how much they were willing to pay for an online course that helped them master the skills they were interested in. Then we used all this data to create a course called Sales Jumpstart. A lot of the course material was built around the information we learned from our survey. In our next Behind the Scenes video, I am going to share how we build our online courses. But as you can see from these examples, this is where our course creation process starts. We figure out what our customers want. Then we figure out how to build that product. And my inbox was flooded with responses. 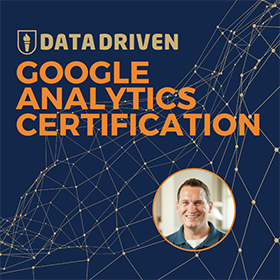 Over 50 people asked to be on the waiting list for our advanced analytics course. There’s a lot of different ways to ask your customers what they want. 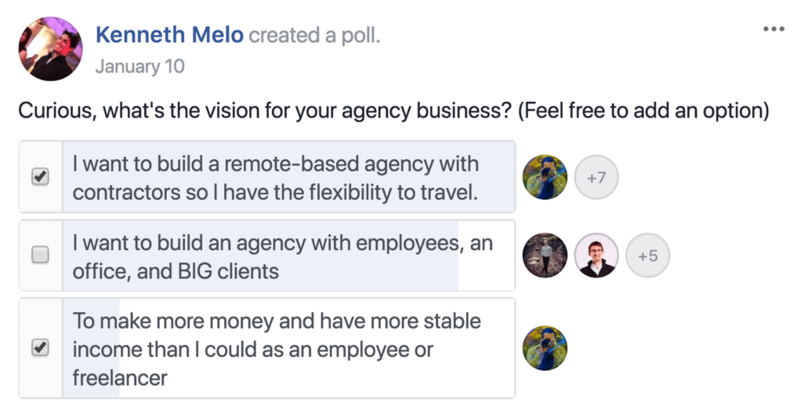 We have even polled customers in our Facebook group to find out about their vision for their businesses. As far as I’m concerned, asking your audience what they want, in a curated manner, is the best way to start creating products. This process helps get your audience invested in what you’re creating. It also allows you to build products that are tailored to the demands of your potential customers. And, this process solves some major marketing headaches. Fulfill existing demand, instead of trying to create demand for something brand new. How can we improve this process? Like I said at the outset of this post, this process is still in Beta. We haven’t reached the point yet where we can create a survey. Get responses and immediately connect with our customers’ needs. There is still a lot of research and market testing that goes into building the finished products. That said, I was excited to share our current product selection process with you. And I would love to get your feedback. What do you think of this process? Have you used a similar method? How do you think we could improve this process? Shoot me an email or share your thoughts in the comments below. This post and video was episode 71 in our 90 Day Challenge digital marketing series.